vessels. 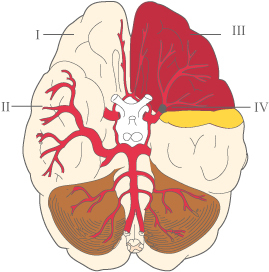 On the left side of the brain the Temporal lope is removed. A blood vessel wall is ruptured. If the clot comes from a narrowed carotid vein (neck vein) this can be seen by an ultrasound scan and it might be possible to insert a small tube (a stent), which expands the vein, or remove the narrowed vein section. This is to prevent new cases. If atrial fibrillation is the cause it is important to determine this from an ECG. The next step is then blood-thinning (anti coagulation) treatment (marevan or similar) to prevent blood accumulating in the hart forkammer.